Called Armadillo since its shape resembles the armored mammal. Raisz preferred to set the central meridian to 10°E, for better comparability it is set to 0° in the image. 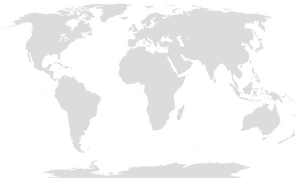 Raisz Armadillo, tilted to show the southern hemisphere. Just to have view of both northern and southern hemisphere.